Saturday, August 8th, will be the busiest day of the season at the Corinthian Yacht Club with two major events running simultaneously and parking – as always – will be at a premium. There will be no parking on Club grounds. Corinthian Lane will be closed to cars all day Saturday. If you do a “drop-off”, there will be a police detail, as well as signage, directing cars to approach the club via the lighthouse with the “drop-off” area located on Nahant Street (at the bottom of the CYC main driveway). A Shuttle service will be running from 7am until 9pm from Riverhead Parking Lot (on left at the beginning of the Marblehead Neck causeway) to CYC. 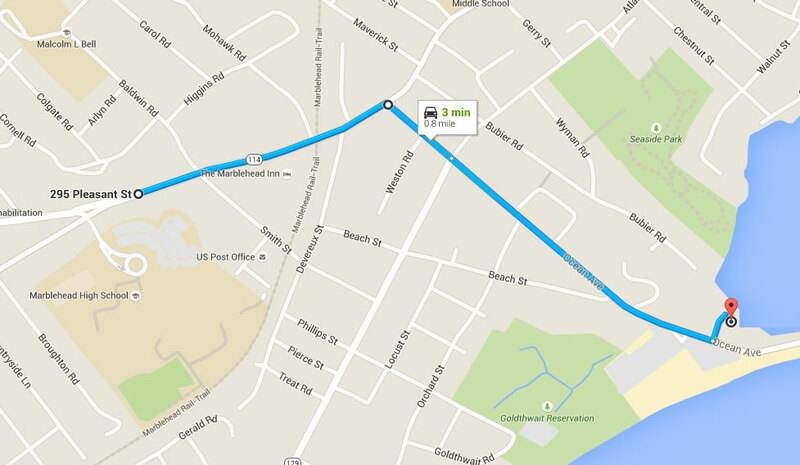 (See map below for location of Riverhead Parking at red icon) Look for the Panerai Banner. Parking on the streets around the club is allowed as usual, but prepare for a significant walk to the club from your car. Also, please be aware that the bicycle portion of the Witch City Triathlon will be using the Causeway, Ocean and Harbor Avenues on Marblehead Neck between 8:00 am and 10:00 am on Saturday. PLEASE anticipate some delays when timing your arrival. Please help us make the day run smoothly by cooperating with police details, event organizers and allowing ample time to drop-off crew and equipment, park and shuttle.